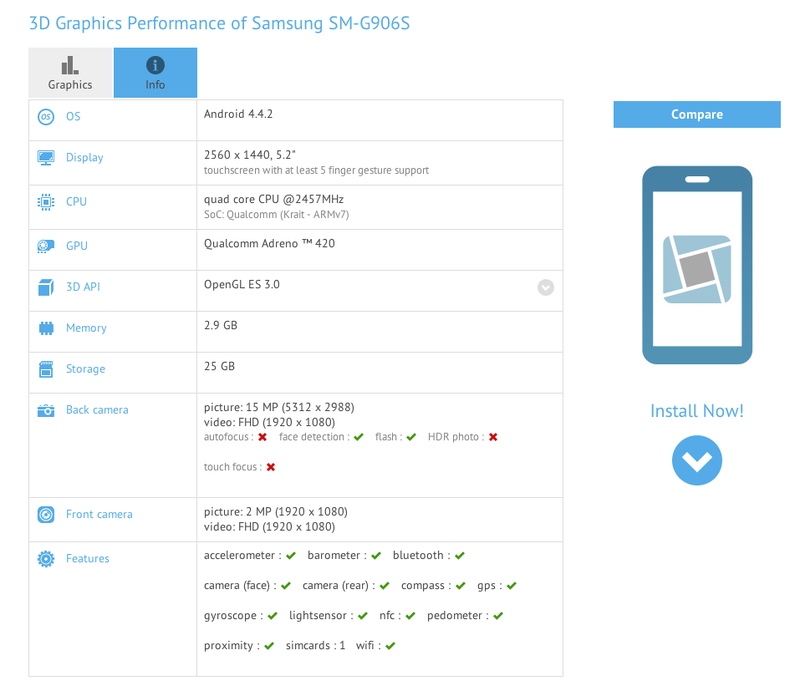 Samsung SM-G906S Appears in Benchmark With QHD (2560×1440) 5.2-inch Display, is It a Premium Galaxy S5? In mid-March, shortly after Samsung unveiled the Galaxy S5 to mixed reactions, their mobile boss, JK Shin, told Korean press that his company was not working on an ultra-premium version of the phone. The question was posed to Shin because rumors (benchmarks too) for months leading up to the launch of the GS5 pegged Samsung as introducing a potentially new premium line of devices, one of which sported a QHD (2560×1440). We even saw apps from a Galaxy S5 ROM mention WQHD, but yet, the device came with a 1080p display instead. With the Galaxy S5 now days away from an international retail launch, speculation over a premium line is back, thanks to another benchmark. According to a listing at GFXBench for a phone under the model number SM-G906S, Samsung has another device in the works with a 5.2-inch QHD display and Qualcomm’s new Snapdragon 805 clocked at 2.5GHz (APQ8084, Adreno 420 GPU). The device also runs Android 4.4.2, has a 15MP camera (16MP? ), and a 2MP front camera. In other words, it sounds like a beefier version of the GS5. For reference, the Galaxy S5’s model number is SM-G900. While benchmarks should never be taken as a confirmation of anything, they are often right and do lead us down a path of information that isn’t typically available until a company announces a product. Scores and info from GFXBench have long been one of our best resources. So what do you guys think? Is this the new premium version of the Galaxy S5?